An angry hippo is a menacing thing. I looked on in shocked horror as a spray of water erupted from beneath the canoe. The huge gaping mouth of a hippo enveloped the center section where one of the men sat, wide eyed, frozen in the moment. Teeth came through the fiberglass bottom underneath him and completely surrounded his legs from the top. Incredibly, the hippo did not close its’ mouth crushing his legs, but lifted the whole craft a meter out of the water. Men went sprawling in every direction. I found myself digging my paddle into the water and steering the canoe toward the mess ahead as my mind said, “Don’t go there! You will be hurt. It’s not safe.” Funny that. I had been asked to guide the Southern Baptist Missions leadership training group at Ruckomechi Camp on the mouth of the Rukomechi River where it empties into the Zambezi. I had flown many of these men around Zimbabwe, Mozambique, Zambia and Malawi for years and was really looking forward to spending time with them in what is, without a doubt, one of my favorite places on the planet; the Zambezi Valley. We had the camp to ourselves and I was impressed with the joy these men took in their surroundings, in their God, in nature and each other. They laughed easy and loud. Jokes came thick and fast. In every situation I felt built up myself, and could see that others were being built up as well. We had wonderful times sharing stories in the open thatched lodge on the banks of the river and around the campfire at night. Being from the Southern part of the United States they had such a different culture from my own and many of the stereotypes of “Good ole boys” were readily apparent to me. I loved the difference. But it was more than their culture. They were made special by what they believed. 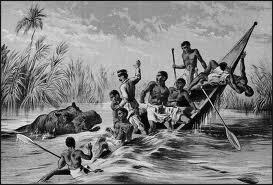 Being attacked by hippos is nothing new in Africa. David Livingston had his encounter as well. So, I guess we are in good company! In the heat of the day they sat up their horseshoes and played under the Albida trees that cover the whole campground with shade. Elephant came right through the camp and walked by the men as they played. It was a lovely sight. I was showering in my chalet one morning when someone called my name. When I got dressed and opened the rickety old door there was a cow elephant right in my doorway eating Albida pods off the roof. I could have reached out and touched her. It is that kind of place. Another morning we got up to find an old buffalo bull lying quietly inside the ring of Chalets chewing calmly. It was a safe place for him, sheltered from the lions that are never far away, and he spent the whole day there not bothered by our presence in the least. I, on the other hand continued to look at him with a jaundiced eye, knowing how quickly these old “daga boys” can be on their feet and at full speed, coming to stick a horn through your stomach. We had once had one of the guests at Fothergill Island killed in just such a situation after surprising a resting buffalo as the couple returned to their chalet after supper. You don’t want to fool with these animals. Many PH’s put them at the top of the list as the most dangerous animals in Africa. I have had my share of hair raising experiences with them and could not bring myself to trust him completely. 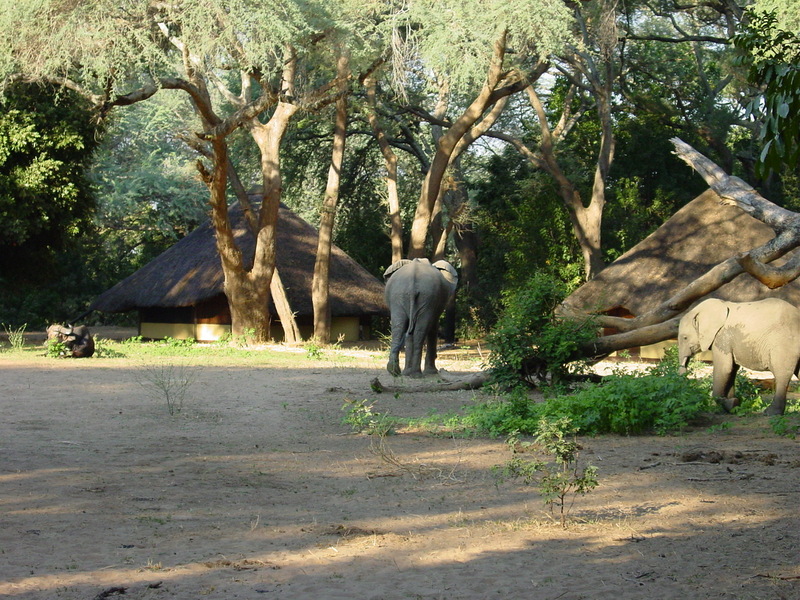 Elephants and Buffalo in around the chalets at Rukomechi Camp. 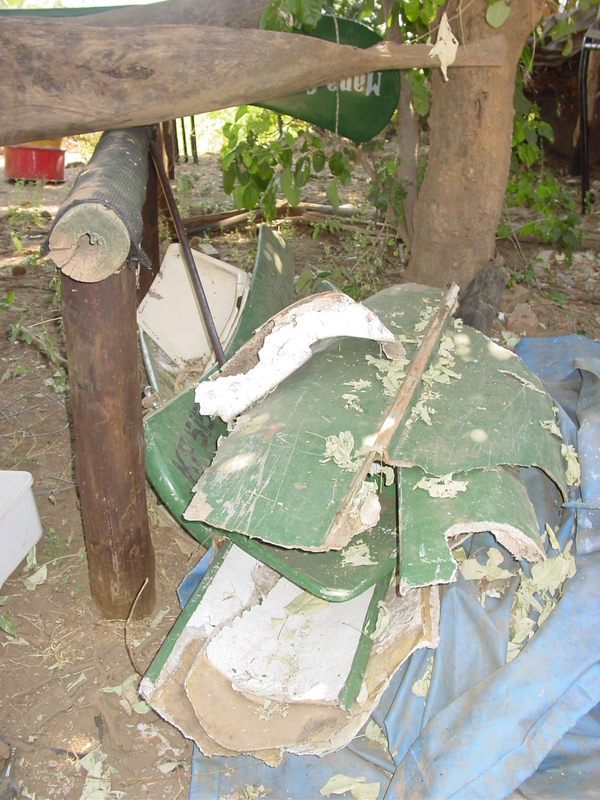 One old “Dagga Boy” was right in between the thatched huts the whole time we were there. There were many activities to choose from there. I took walks in the mornings and we did game drives most afternoons. But one day we organized a canoe safari. We took 3 canoes and put in about 10 kilometers upstream from Ruckomechi, drifting lazily downstream. An African river guide was in the back of one canoe with one passenger, another canoe had 3 men in it and I followed up in the back of the last canoe with another man. I had brought a few fishing rods, as tiger fishing is amazing on the Zambezi. I set up a rod for my guy with a spinner on it and showed him how to cast. He had that figured out in no time. Then I told him to put the spinner right at the downstream tip of one of the many little islands we were passing. He did and instantly was hit by one of these salmon size fighting fish. I don’t know whether they are named for their stripes or their huge set of teeth but it is thrilling to have one of them on the end of your line and you will only get about one in four that you hook all the way into the boat. Often you will get one right up to the edge after a long fight and at the last second it will jump into the air, tailwalk across the water and spit your tackle out of its’ mouth right in front of you, giving you a sly look as it glides back into the water, apparently no worse for the wear. I like that. Adventure on the river in times gone by, and they are still there to be had. We drifted on and came to a small island where an elephant grazed quietly next to the water. We were able to come only feet away from him as he ate above us unconcerned. As the sun started to go down we approached Ruckomechi river mouth again and were able to see our camp. 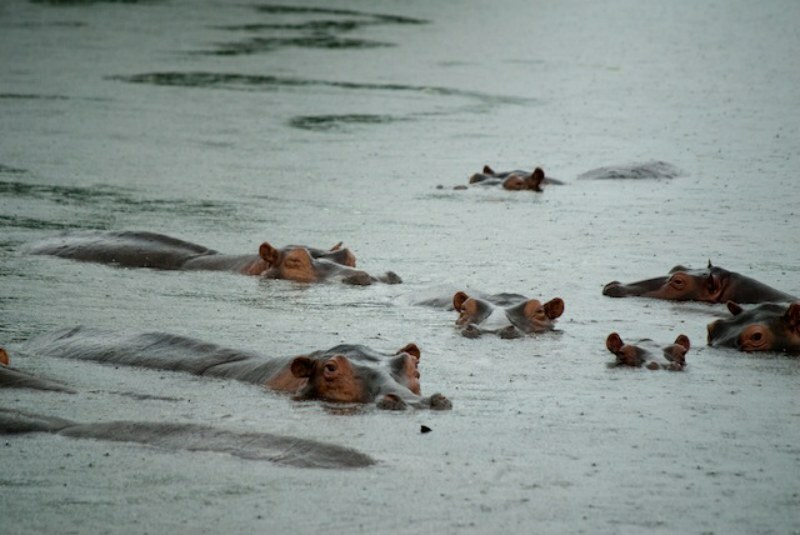 We could also see about 4 hippos who had spread themselves evenly across the channel we were in. The small grass islands on each side of us left only 40 meters or so between their banks and it was pretty crowded with three canoes and 4 hippos! They laughed at us, as hippos like to do, and one opened his mouth in an aggressive display of his very large teeth. We held back just paddling in position, deciding what we should do. All but the middle boat, which was very short on steering and brakes. They had still not quite learned how to handle their craft. They just kind of circled around. The river guide in the front boat said he thought he could get through by the edge of the bank of the island to our right and started through quickly. The hippo all went under water as he passed. The second canoe was drifting dangerously toward where the hippos had gone down and I told them to get back over to the edge so we could try to go through the same place. 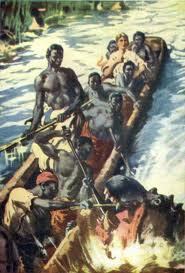 They began to see their situation and paddled toward the bank with feeling. Having gathered speed now, they hit it bow first and the current turned them gently around into a backward drift directly over where the hippo were. I beckoned them back but as I did the water seemed to rise on it’s own under the canoe and the open mouth of a hippo picked the little craft a full meter into the air. I found myself paddling toward the confusion while one man drifted downstream and was picked up by the other canoe. We pulled up by the capsized canoe and, as is usually the case, everyone really wanted out of the water, almost capsizing us as well. I told them to climb quickly onto the upturned boat and we towed them to the shore as the hippos laughed and scoffed at us. 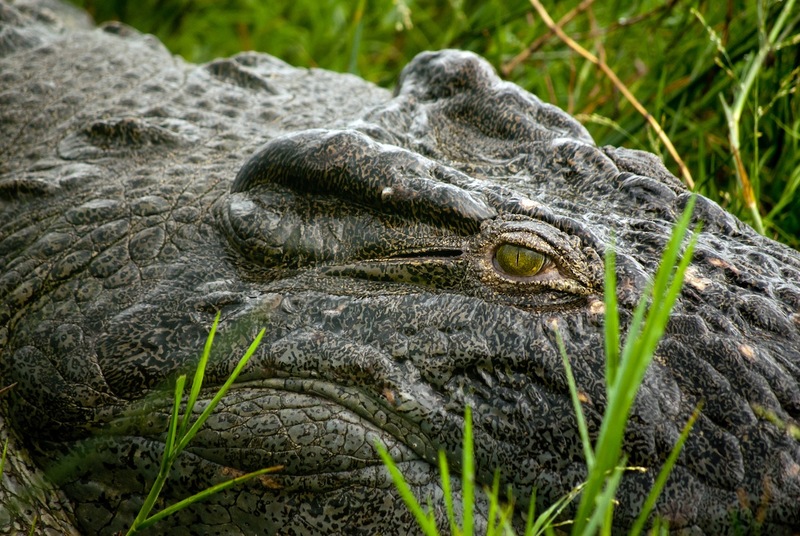 There are massive crocs in this area who are not above picking up an easy meal. Only a month earlier an American girl had been taken right out of the canoe she was riding in and this was very fresh in my mind. We worked quickly to get the men to the shore of the island and as two of them dripped dry I took two men over to the mainland riverbank. The hippo were now quite aggressive and as I walked the canoe back upstream, returning for the others and thinking of crocodiles, they moved even closer. I loaded everyone else into the canoe and hugged the bank of the island as we again went downstream to the actual river bank. I pulled the canoe up onto the landing and we all walked into camp from the back side. 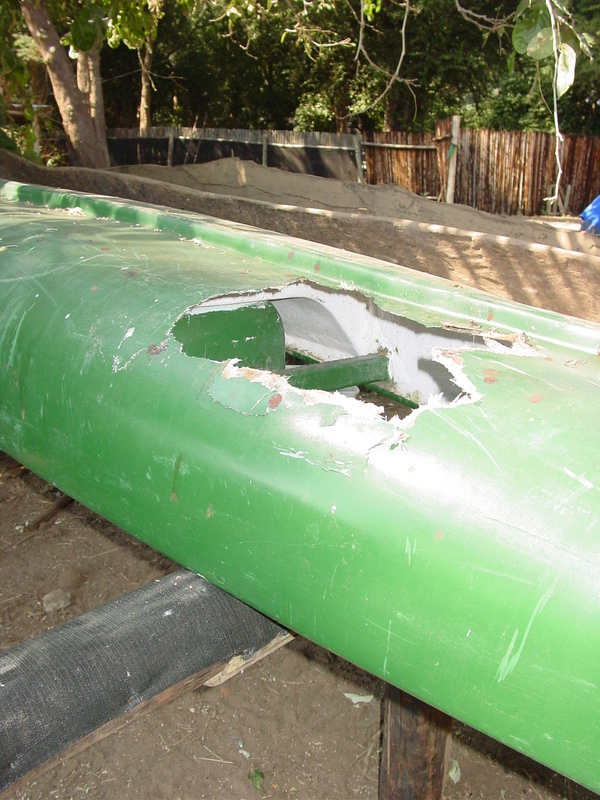 As we did we passed three wrecked canoes with obvious hippo bite chunks out of them and one that had actually been smashed into 4 large pieces and a bunch of small ones by an angry elephant bull. Apparently the animals in this area did not always take kindly to people in their section of river! There were some very entertaining renditions of the story around the campfire that night and the laughter flowed as easily as the river. Sometimes shy, always capable of major damage. 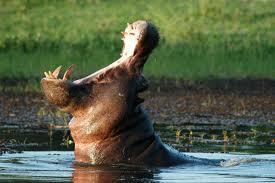 Hippos are said to kill more people in Africa than any other animal. Great to hear from you Rob. It has been too long. I was there last month and heard you were around. So sorry I missed you. Lots of good memories. Blessings on you my friend! Wow, Jon. You’ve had so many near misses with wild things, it’s truly a miracle you’re still alive! Just keeping up with you. Life is wonderful. We miss you here. My pix have suffered since your departure. Love to see your new stuff. Love your blog!